I have watched many a role playing game in my day. Notice that I said “watched” and not “played”. I’m the guy at the table with his head buried in the rule book, delaying the game while highlighting my apparent lack of skill. This tale looks at the zombie genre through a comedy prism. While the threat is real, it doesn’t take itself too seriously which makes for an easy and entertaining read. The Government recruiting role playing gamers to help fight off a zombie apocalypse would never really happen. However, when you put aside everything you know about the red tape that can come with an emergency response, it’s actually not that hard to believe. After all, who’s better at putting together strategies outside of the box? Aaron Bunch is the central figure of the story and the RPG master. He is easy to root for because we all have a friend just like him. You know, the guy who has all the sense in the world except the common kind. You want to hug him and choke him at the same time, which makes his journey an amusing one. The dialog is very wordy at times, which is normally kind of boring, but it works here. E-mails tied to Bunch’s research into a possible solution brings a mixed bag of goodies that augment the story and bring about a chuckle or five. The gray tone artwork pays homage to The Walking Dead while bringing simpler and detailed depictions to the table. The red highlights representing the blood and gore serve the story in dynamic fashion by pulling the reader out of the hilarity and reminds them of the risk of exposure as zombies are trying to eat people. 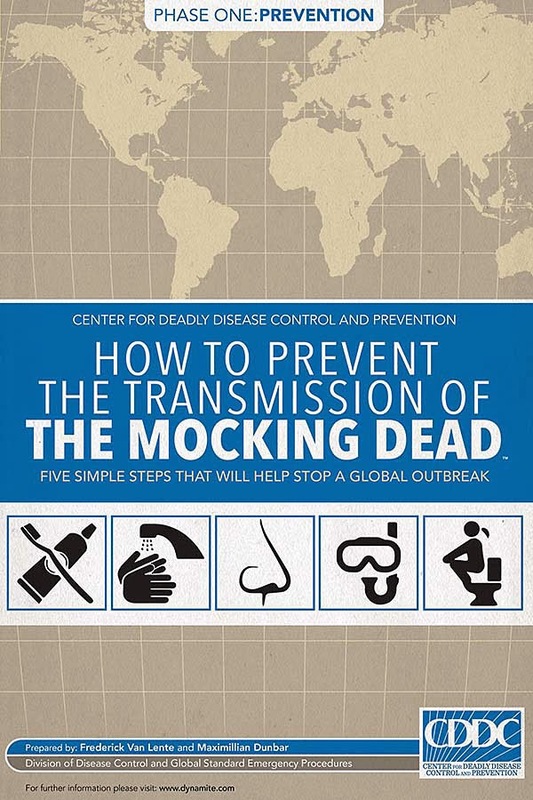 The Mocking Dead is thoughtful parody that grabs your attention instead of making you roll your eyes at the ridiculousness of it all. It’s not Shakespeare. It’s just a fun read.